WOULDN’T IT BE NICE TO WORRY LESS ABOUT MONEY? Yesterday we make a trip to the Dollar Store to pick up some bits for an educational project I’m working on for our son. Outside on a bench sat a homeless man in his 30’s, scruffy looking but alert. He looked up at my wife as we walked by and asked if she had any spare change. She did and she smiled and without passing judgement or any hesitation handed him two Toonies. He smiled, thanked her and we went on our way. You obviously can’t do that for everyone but once in a while if you’ve got some spare change it may make a difference. Just behind us was another lady who he only looked up at when she was walking in. Her response, “No, get a job a$$hole and stop being lazy” and Mrs. CBB nearly hit the floor. She turned around and just stared into the woman’s eyes and walked away as you can’t fix stupid. The entire time we walked around the shop Mrs. CBB was thinking about him and decided to buy him a bag of chips and a bottle of pop. When we went out he thanked her again one more time which came as a surprise and then she handed the bag to him. He put his hand on his chest looked up at her and said, “For me?”. “Yes, this is for you. It’s not much but I wanted to buy you something.” She patted him on the shoulder and told him to have a good day and he dug into the bag with a big smile on his face after saying thank-you a million times. Later that evening Mrs. CBB said she wished she went right back out, picked him up and brought him in the store and told him to get what he needed. It’s amazing what you think of doing after the fact but the same thing goes with anything in life. Sometimes you have to live it to understand it, make mistakes and then work on fixing them. Most often we stumble before we can climb which means hitting rock bottom before shooting to the top although some people get stuck in spots for various reasons. Not everyone has the answers right away and there have been homeless people who are now living the dream because they found their way. It can happen but it always falls back on your motivation for success and sometimes being in the right place at the right time helps. The debt cycle works the same way because unless you live it you need to know what you want in order to surpass the goals you set forth. For example, I don’t want to live on the streets it’s terrible so I will find a job, I will seek help. Or, I want a better job so I will find ways to gain new experience, volunteer or go back to school to learn. Lastly, I’m tired of being in debt so I WILL find a way out of debt, budget my money and find other ways to earn more money. If you think that a budget will save you from debt, you’re wrong. It will help you understand your financial picture but if you don’t have enough money to go around and have cut everything you can to the bare minimum you likely will keep living pay to pay. What happens if something comes up and you have no money to pay for it? What happens if you lose your job? What happens if you fall ill? A budget will help for sure but it can’t pay the bills without the income coming in. You have to get ahead of that budget by miles. The fact of the matter is that you have to earn more than what you pay into your budget which includes paying yourself first. If you don’t pay yourself first by way of investments or savings then you need to have some form of this after your bills are paid. This is the only way to get ahead financially. Owning a home doesn’t mean you are getting ahead until you own that home free of debt. Why? Because until then the bank owns it even if you have equity in it. To take it or not is up to you. Mortgage debt for most people is the least of their worries, it’s the consumer debt that breaks people in the first place. Credit cards and lines of credit used frivolously and paying the minimum balance is a crisis that needs to stop. Breaking the debt cycle once and for all means that you will no longer be attached to debt and the stress of where money will come from to pay the bills will slowly decrease. I don’t think worrying about money will ever go away whether you are debt free or not because there is always something you have to pay for. Even into your retirement years you really don’t know what things will cost you and whether financial catastrophe will strike at any moment for you or someone you love. Yes, many parents still jump in to help their children even as adults when they fall on hard times and risk never seeing that money again but they do it for the love of their children. That will never end unless there is no money to give. Breaking a debt cycle doesn’t just mean you’ve come from a life of living on welfare or having parents who can’t find jobs or are addicts or have mental health problems or illnesses. That could be anyone. Having debt and lots of it does not discriminate which means anyone and everyone has it or has had it to the point where they worry about how they will pay the bills at some point in their lives. Admittedly there are those people who come from wealth or become wealthy from winning the lottery, investments or hitting it big from business ventures but even then they are not safe from bankruptcy and the debt cycle. Whether you are rich or poor the debt cycle can follow you for life like a hair on your chin that doesn’t want to come out. You can cut it and if you do pull it out it will most likely come back again. (for most people) Growing up poor is not fun but for many kids they don’t know any different but they do have eyes and ears and they understand when they are at a certain age the importance of money. The debt cycle in Mrs. CBB’s family was fairly constant for her growing up although they never did need social assistance of any kind. There were no savings in the bank, ever. If there was it would get eaten up by the next bill that came in the mail and this lifestyle continued for years and years and year and years. There wasn’t a time where Mrs. CBB can remember that her parents were happy financially because there was always something to pay. Even when her grandmother passed away and her father inherited $100,000 that money all went to debt to pay off mortgages on properties that were sinking faster than he could take care of them. This is a classic case of getting in over your head when it comes to owning a business and mortgages when you don’t have the capital to back you up in case something were to go wrong. Who suffers? The family suffered dearly and this debt cycle brought on bouts of family issues that forced the kids to get a job early and work for everything they needed. There was no money to give the kids unless it was a dire emergency so away they went to work delivering newspapers and then fast food restaurant shifts nightly after school. School work suffered, lack of sleep, no social life and mental health all suffered because this debt cycle put a strain on the family that no one will EVER understand unless they’ve been there. Mrs. CBB was always jealous of the kids who grew up on a certain side of town who had two parents who worked, a nice house and they went on vacations. Their clothes were always fresh looking and pressed and hair cuts would often show new styles along with fashion accessories. Owning a bike was a luxury as was a car when she was in high school but she had neither even though she worked full-time from the age of 15 years old. Where did the money go? It went right back to her help her parents and herself to get by day after day. Saving money was not important to her because she didn’t understand it. Her parents didn’t even understand it so how would she? It wasn’t until she was around 19 that she really woke up to the debt cycle when she moved away for school and had to pay rent and other bills that come with renting an apartment. After she moved back home she worked day and night sometimes 3 jobs because she wanted to pay off her OSAP and have money in the bank. That was her main goal, to have money in the bank. That was success to her and essentially breaking the debt cycle in her mind. If her parents couldn’t do it, she would and wasn’t going to waste any time doing so. Boy, did she ever. She not only went on to pay for her OSAP in full over the course of 9 years which she now regrets as she could have done it sooner but she saved for a down-payment for her first house before the age of 30. Not many people can say the same without help from family or an inheritance with the down-payment and she walked in with zero debt apart from her vehicle loan. Even then her situation could have turned deadly if something were to happen with her job which is why she was a saver and hard-core. I did the same but from an even younger age at 21 buying my first home but I grew up far different from she did and I did have parents who taught me about money and they weren’t always skint. This is why we can’t judge people based on where they are in life because for some people living in an apartment is success. You don’t know how long they had to learn how to live in a tent, on a park bench, motel, shelter or in a vehicle. Tent city is a real thing in Canada and it represents poverty on levels that we’ve never seen before. It’s not just addicts who live in these tents, it’s families and individuals who are left on the streets for a myriad of reasons. Sadly, you can’t give help to those who don’t want it. Some do, some don’t know how to ask for it others are too depressed to ask. This world is either changing or I’m getting older and understanding more about what we don’t see as kids because it’s not necessarily on our radar depending on how or where we grew up. Some kids live it and live it from the time they are born until the time they can break free and create their own path in life. Others, get caught up in the debt cycle and it continues as a revolving door. Debt and job loss can crumble people to the ground and sometimes it takes time to get back on their feet even when kids are involved although there are plenty of resources available. Sometimes though, even the system fails those people in need. Calling someone an a$$hole is not the motivation or way to treat anyone no matter what their story is. If you truly want to break the debt cycle and have had enough living pay to pay and want out there are a few things you can do to get started. As I mentioned a budget alone won’t save you from the debt pit but it will offer you clear indications of where you need to improve your finances. So, let’s go over a few things you can do right now to work on breaking your debt cycle. If you have a bank account then you can make an appointment to talk to a financial advisor with your bank unless you already have one. Talk to them about your situation and see what professional advice they offer you. Instead of breaking the debt cycle on your own or by reading blog posts such as this talk to someone face to face who can guide your situation. Obviously, budgeting is number one. If you don’t have a budget, get one and it just so happens I offer one for free here at Canadian Budget Binder that you can use. Go ahead and download it or print the simple budget, whichever works for you. If there is another budget you have in mind then go grab that now. Budgeting means you need to get back to basics which means eating at home and saving as much money as you can, where you can. You no longer should be using your credit cards because you will never beat the debt cycle with them as long as you are paying minimum payments. Get rid of them and focus on paying off what you owe. Remember where you were and where you want to be. Remind yourself DAILY. Keeping your mind fit and your body is very important whether it be from meditation, education or going for a walk every day for a cleanse. This is time where you get to push yourself to be better at what you do because you want that success. Often the most successful people in life talk to themselves, lots. 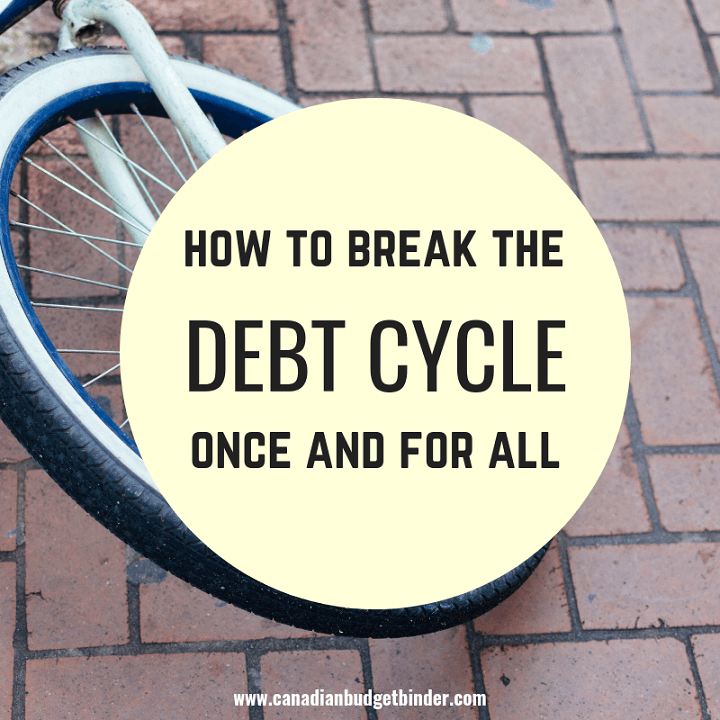 Breaking a debt cycle is not easy but that moment when you finally feel you’ve got control of your life back even if it isn’t the life you’ve dreamed of remember it’s a step in the right direction. That feel good outlook and positive smile is more than you will ever need as long as you can conquer the debt cycle once and for all. Oh, and if you fall get right back up the next day and start over, just don’t make it a habit because habits are often what get us into trouble in the first place. Discussion: What other things have you done in your life to break the debt cycle? Did you see or feel debt growing up? What Mrs. CCB did was wonderful. I agree with Deb, the world needs more people like her. Growing up there never seemed to be money for anything although my father always, always worked 2 jobs. I got my first job when I was 12 (newspaper route). I quickly decided that I would deliver 2 different papers but on the same route. I worked through school at various jobs and saved enough for 1 year of university. I finished my degree by going to classes part-time rather than getting student loans. I wasn’t going there. I also worked full time and had a part-time job working nights and weekends. I worked the same part time job for 23 years.I bought my first house at age 21 and paid it off in 7 yrs. I always maxed my RRSP every year even though it meant living on tomato soup for dinner at times. The pay myself first, eating at home, continually upgrading myself, sometimes at my own expense, at work and giving 100% effort at work regardless of who was my boss would be the best tips I could pass on. Your article today was excellent starting from helping that man on tough times. Keep spreading the word. You are making a huge difference. Mrs. CCB is an angel. We need more people like her. People need to remember … Oh by the grace of God go I and sharing is caring.